How do you turn a summer getaway into a year-round home? For Astrid Insieme, an interior decorator, and her husband, Brian, it meant adding more space — over two-and-a-half times more to be exact. The A-frame home in rural New Hampshire that they share with 15-year-old daughter started out as a tiny, ramshackle cottage measuring 800-square feet. Its transformation has happened over time, starting with major interior and exterior renovations — it was previously uninsulated and the grounds had a tendency to flood — and more recently, an new extension, which is nearly complete. When the couple puts the finishing touches on the addition, the home will be a comfortable (and insulated) 2,100 square feet. 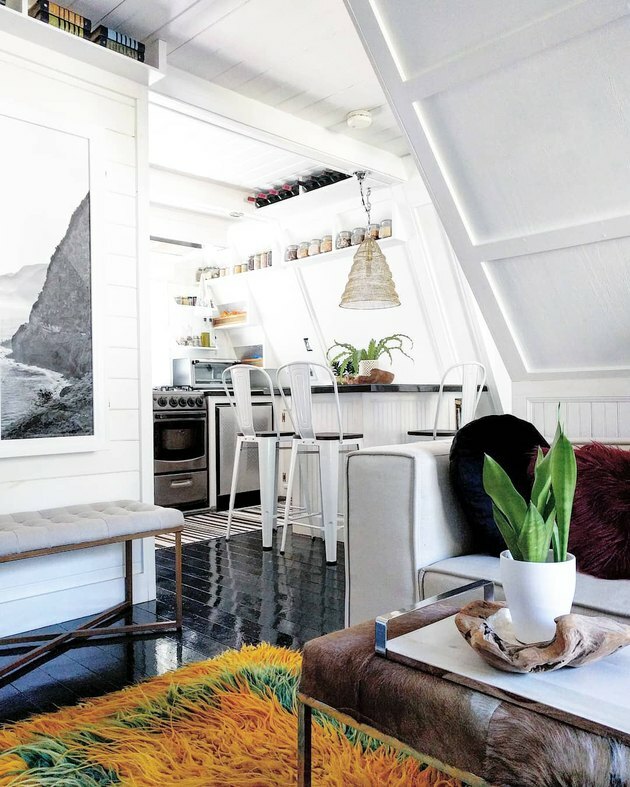 But even though they've increased the square footage, the charming coziness of the original A-frame home remains intact. 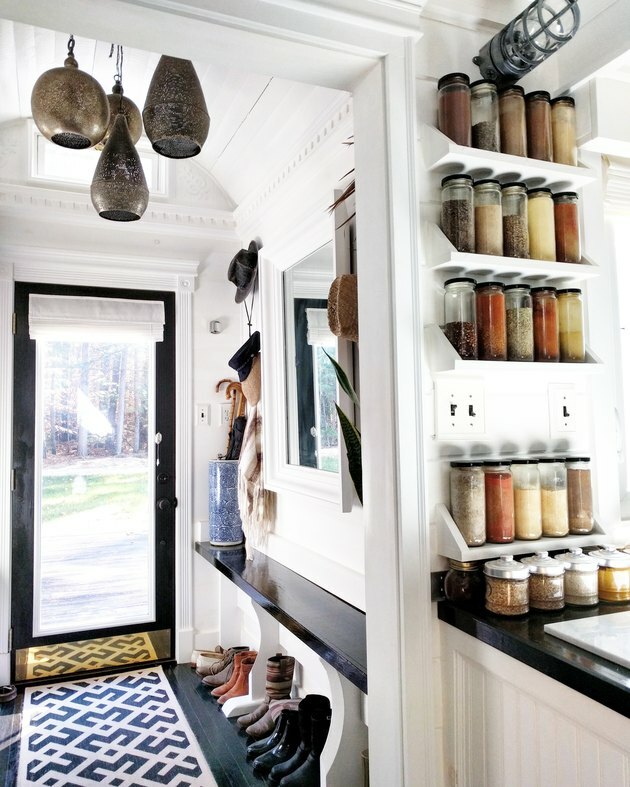 The compact kitchen packs plenty of storage into a small space and bright white paint and colorful textiles make the living room, with its sloped walls, feel open and airy. "I really wanted our home to feel like a worldly retreat, especially because we live in such a quiet and remote area," says Astrid. "It was my (intentional) way of feeling connected to the vastness of the outside world." Thanks to their thoughtful renovations, the couple has created a year-round home that still feels like an escape. 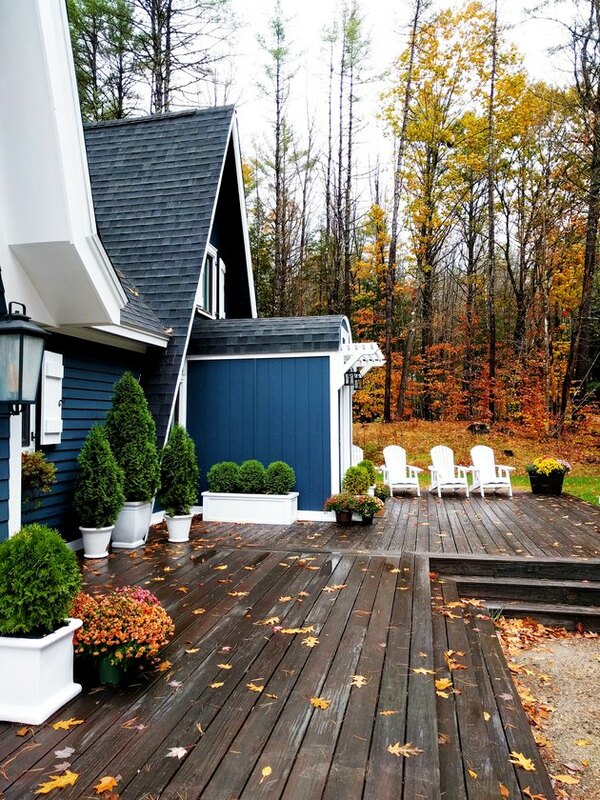 The exterior was painted in Valspar's Dutch Licorice and accentuated with crisp white trim. White Adirondack chairs from Overstock line the path to the entrance. "Local rumor has it that one of the designers of the Apache helicopter built our original A-frame cottage using the plans from Popular Mechanics that were advertised during the late 1960s, but this has not been fully substantiated,"says Astrid. "But that story has always been the lore in our neighborhood and judging by the framework of the original construction, it could very well be true!" The couple added the barrel-vaulted entry to the house a few years ago. The walls are clad in shiplap and they customized the built-in benches using materials from Brian's childhood dining table. 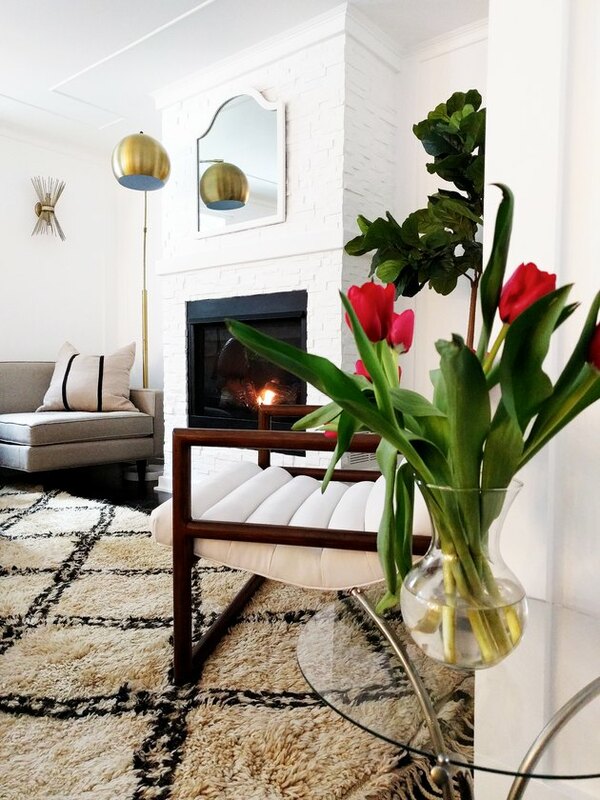 Pendant lights by Zenza, a runner from Wayfair, and a vintage umbrella stand complete the space. The kitchen's lower cabinets are made of hickory and the upper cabinets are from Ikea. The couple constructed the other cabinets and built-ins themselves. 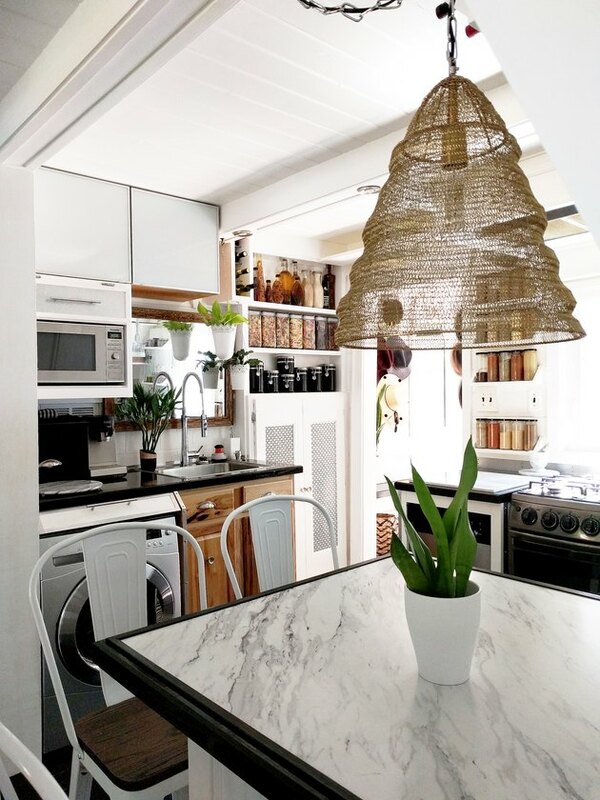 A pendant from World Market hangs above the marble-topped table. The living room in the A-frame is outfitted with a vintage fireplace found on Craigslist. 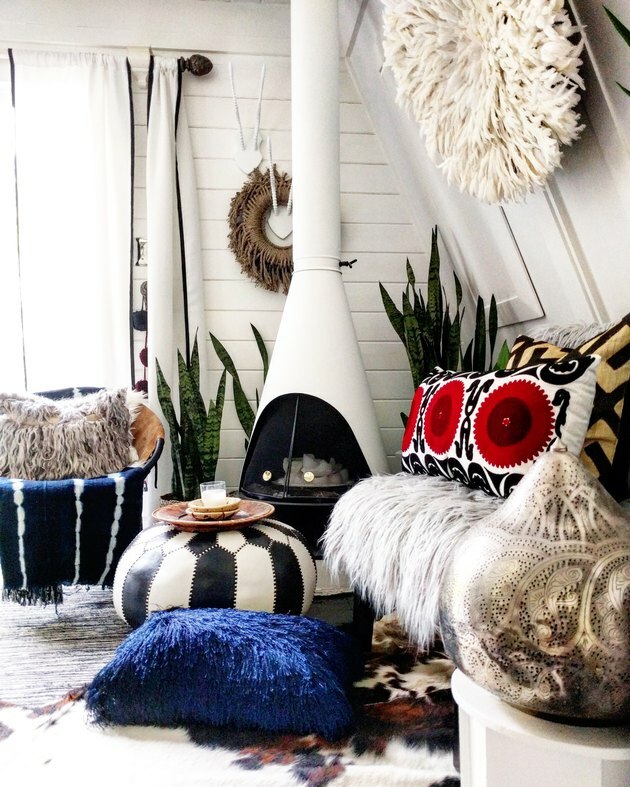 Astrid brought in an eclectic mix of pieces, including a Cameroonian Juju hat from St. Frank, a pouf from Beyond Marrakech, and a vintage chair customized with faux yak fur. At the other end of the living room, a photo taken by Astrid was custom framed to conceal a cabinet that holds a pull-out ironing board. 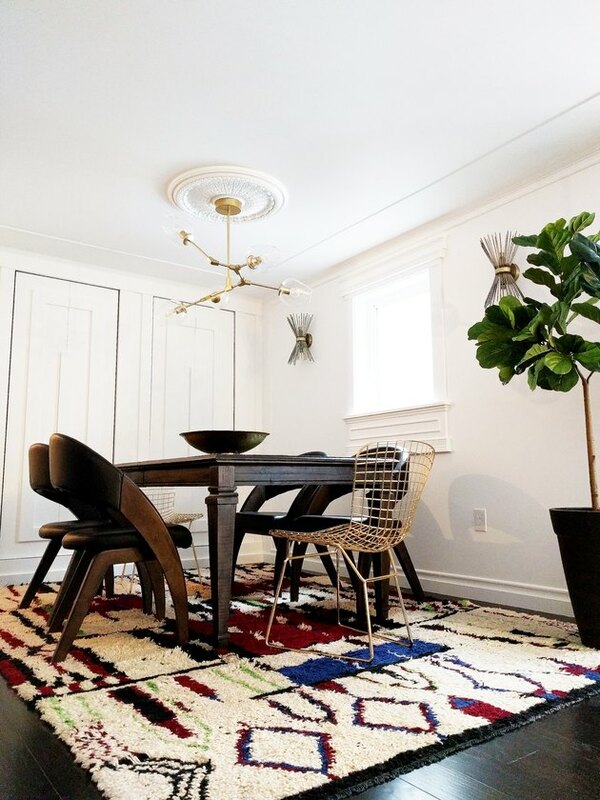 A vintage Beni Ourain rug from Kechmara Designs anchors the living room in the addition. A vintage mirror hangs above the fireplace, which the couple built and faced with stone that they later whitewashed. The couple built an in-wall hutch in the dining room, which is located in the new addition. The chandelier is from All Modern and the wall sconces can be found at World Market. The master bedroom is tucked away at the top of the A-frame. 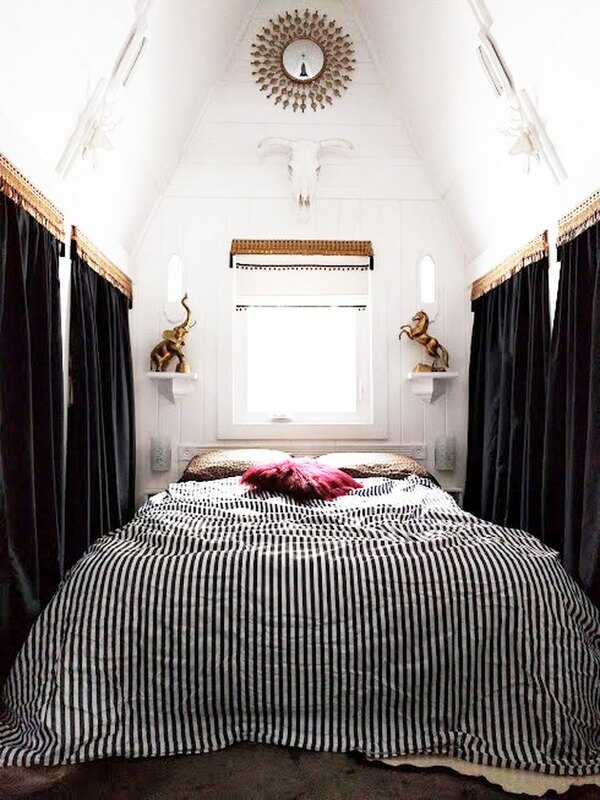 The black curtains conceal the couple's tiny closet areas. Once the bedrooms are completed in the addition, this space will be transformed into a walk-in closet and dressing room. Astrid hand-stamped the wall treatment in the powder room. 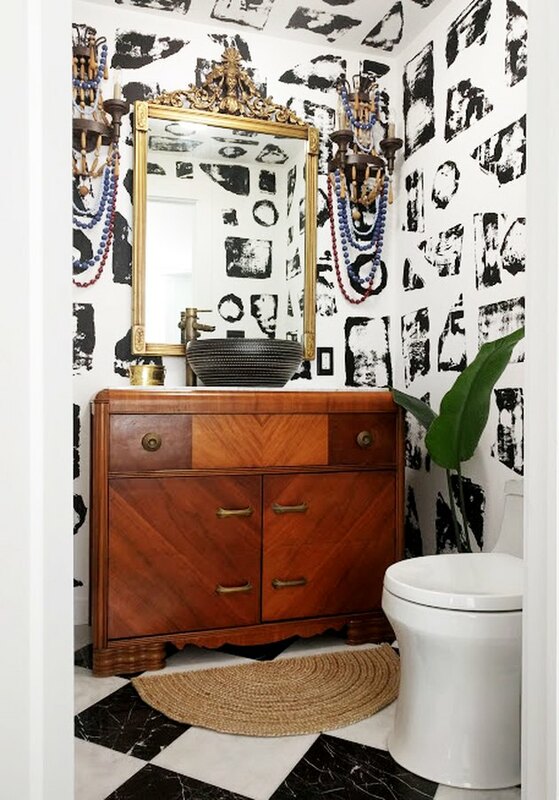 The couple transformed an art deco dresser they found on Craigslist into a sink vanity. 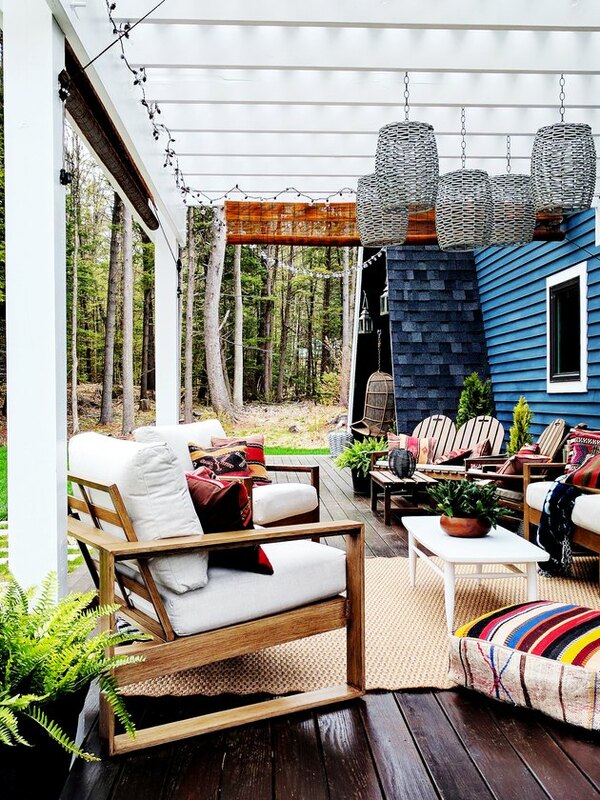 A pergola shades the lounge on the back deck. They upcycled old resin baskets into solar-activated pendant lights that hang above the refurbished vintage coffee table, and the outdoor seating is topped with colorful kilim pillows from Turkey.